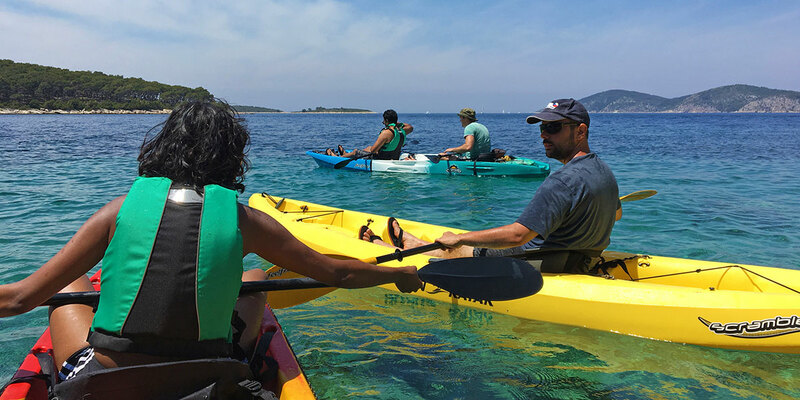 Be in safe hands with your local guide the whole time and experience the best parts of the Hvar coast and Pakleni islands, discover the beautiful hidden beaches and escape the big crowds. SUP or Paddle Board Yoga is the art of performing yoga on a board on the sea. It combines yoga poses with a variation of stand-up paddleboard surfing. From 1 to 30 April we offer ONLY a guided kayak tour or full day kayak rental under condition that it is already booked at least 2 days in advance and that the weather is suitable for kayaking (calm and enough warm). 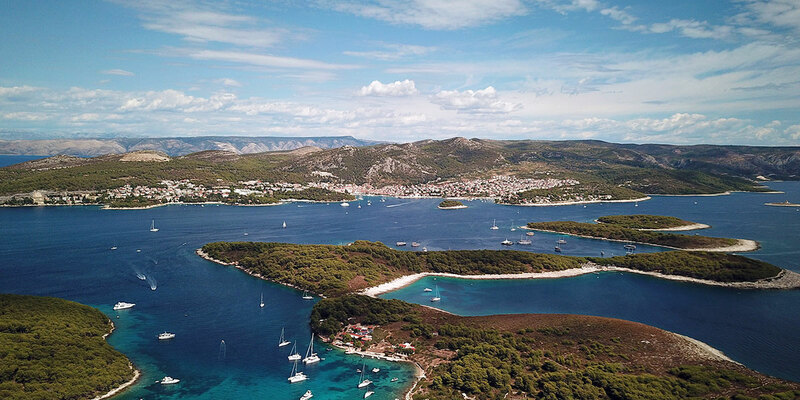 Air temperatures on Hvar in April are usually between 12 – 17 C and sea temperatures are between 13 and 15 C. From 1 May until 15 October 2019 we have again regular working hours from 10:00 AM to 06:00 PM, every day including Sundays and holidays. 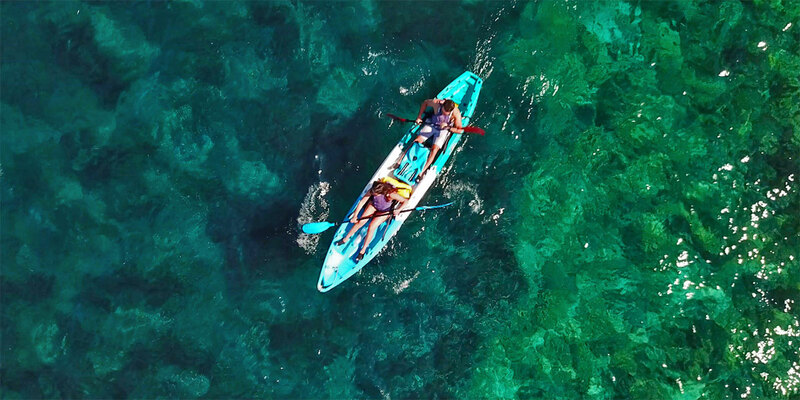 You can already make bookings for the kayak or SUP activities in 2019 to be sure that equipment is reserved for your kayak or SUP adventure and get 10% early booking discount. You can take advantage of our various discounts and save the money by using our on-line booking. We give you early booking 10% discount on prices for all our kayak or SUP activities if you book over our website at least 2 days in advance. You can also benefit from our special prices for a full day kayak or SUP rental (earliest pickup at 10:00 AM and latest return at 6:00 PM) where you pay only 3 hours of rental and you can enjoy your kayaking or SUP adventure up to 8 hours. Explore and enjoy Pakleni islands and Hvar surrounding by the sea, all equipment is included in the price. 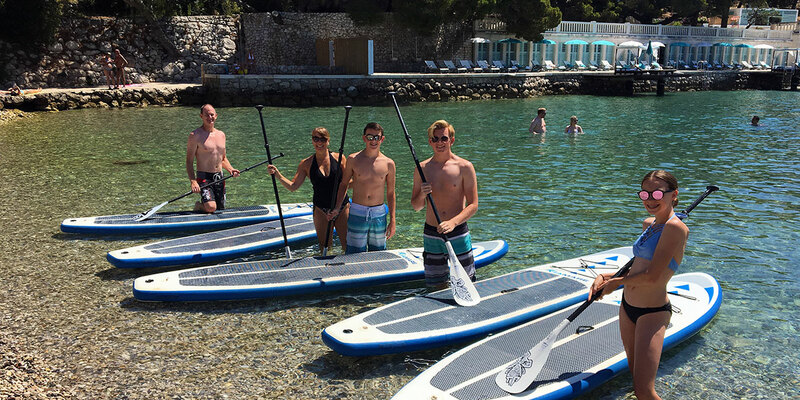 We also offer group booking 10% discount on prices for all our kayak or SUP activities if you book for at least 4 persons or more. You can also benefit from 25% discount on your second booking regarding any hiking or Kayak & SUP activity with us (not cumulative with other discounts and not valid in the case that only rental of kayak or SUP in duration less than 2 hours was previously performed). Notice: Due to off-season, until 1 May 2019 some restaurants in Zdrilca (including “Tri Grede”) may be still closed. Keep that in mind and take enough water and food (e.g. sandwiches) on your kayaking or SUP trip to Pakleni islands. All our customers using our kayaks or SUPs can benefit from 10% discount in restaurant Tri Grede on Marinkovac island (part of Pakleni islands). This is a perfect spot to take a break from paddling (about 30-45 min from our center), eat or drink something, swim, snorkel and enjoy the wonderful beach. Upon arrival just show our flyer (map) to the staff in the restaurant to claim a discount. Restaurant is owned and run by local family from Hvar. Why not to try the private tours? We can also organize one day or multi-day kayaking or SUP tours that are tailored exactly to your wishes, skills and group size. We are familiar with all possible routes in vicinity of Hvar and we can offer you an almost unlimited number of options at a fair price. Share with us what you want to do and we'll organize everything for you, from a tasty local food during your journey to accommodations, or, if you are tough enough, you can try more challenging kayaking routes or some robinson adventure where you can sleep outside in the wilderness. You just have to contact us and we will make your experience of Hvar unforgettable, showing you all wonders of Pakleni islands and Hvar coast including the secret bays, beaches, cliffs and pristine places that are away from crowds. In the mood for hiking? Sometimes the weather in Hvar is not favorable for kayaking or SUP, and there is certain amount of days with medium or stronger wind (especially in the afternoon) that isn't very pleasant for paddling. However, our hiking tours can be quite pleasant on these days, because the wind or colder weather won't bother you on land. In addition, if you still want to do kayaking or SUP on some other day after your hiking tour, we offer you 25% discount on your second booking with us (not cumulative with other discounts). Book here one of our activities (kayak or SUP rental, kayak tour, SUP school, SUP yoga) and start your adventure!